Alongside the European Election 2009 a Europe-wide JuniorVoting is carried out. This is the largest European school project ever! JuniorVoting aims at experiencing and practising democracy. Elections are prepared and implemented during lectures, and for one month students (adolescents aged 12 to 20) of various forms of schools are involved in the project. Primarily JuniorVoting focuses on political education. To get inspired teachers have access to a variety of proposals as to the possible content of lessons - all focusing on the topic of European election. The highlight of the project is a simulated election carried out amongst schools all over Europe one week prior to the European Election. Results are disclosed at the same time than those of the European Election. In schools, two main pillars carry the project: the lectures and the actual election. On the one hand, the teachers deal with the subject in their lectures, and on the other hand the students organize the election themselves. JuniorVoting is not merely an election; it is a practical concept for political education. Instead of writing an exam at the end of the project, a real election is carried out. JuniorVoting aims at encourage and enable adolescents to take democratic responsibility: the participation in democratic and political processes within Europe should be experienced in a positive way and adolescents should feel comfortable to do so. The youth has to grow up experiencing democratic processes and practise how to form a political opinion. The election forms the climax of the project, however, from an political educational point of view its preparation and follow-up during lectures is of primary importance because this imparts knowledge and the ability to participate to the students. The emphasis lies on practising how to take decisions and form opinions. Goals of the JuniorVoting project are to raise awareness amongst the younger generation of the significance of Europe and to make a lasting contribution to encouragement to participate in elections. JuniorVoting creates educated voters - not blinded voters. Implementing JuniorVoting as a concept for political education can be done in various ways. Looking at how the project has been realised in the various member states that has been clearly demonstrated in practise. In Germany JuniorVoting is a project offered to schools free of charge and on voluntary basis. JuniorVoting becomes alive only through the teachers' dedication in team work with the students. 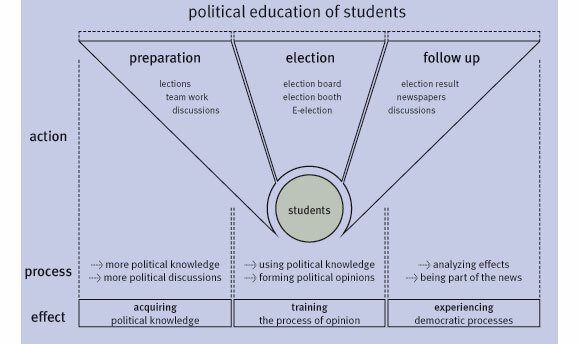 The successful preparation and follow-up of the political study material depends greatly on the teachers' experience. They are the fundament of the project. The realisation of the actual election though is in the hands of the students. To enable an easy implementation of JuniorVoting, the project provides schools with comprehensive study material and supportive facilities such telephone hotline, election announcements, election directories, information leaflets, directories, videos, seminars, polling booths or an on-line election platform. This concept whereby the school is seen as independent organizational unit in combination with all the support and study materials has proved very successful over the years. It ensures a high level of quality as well as a smooth realisation of JuniorVoting - regardless of the location of the school. In the past scientists have gone through the project JuniorVoting with a fine-tooth comb. For instance scientific research took place alongside JuniorVoting in Germany, and a similar project called 'Kids Voting' - involving more than 6,000 schools and 5 million students - has been carried out in the USA since more than fiveteen years. It was revealed that the knowledge about democratic procedures as well as political coherences has dramatically increased following those projects. Students benefiting the most are those who attend schools with a lower level of education (secondary schools), as the gain in knowledge is the highest here. Apart from that it was established that students inspired their parents to participate in elections as students increasingly dealt with the topic of election and promoted political discussions within the family. A study shows that the number of parents going to real elections increased on average by 4% (in some cases even up to 9%). This indicates the project particularly appealed to those families that already had distanced themselves from any kind of political involvement. Since a few years the idea of the JuniorVoting project has been carried out in several countries. For instance, in Germany JuniorVoting has been taking place since 1999 alongside the election of the Lower House of the German Parliament, election of the parliament as well as the European Election. More than 365,000 adolescents have participated so far. Alongside the 2005 election of the Lower House of the German Parliament a JuniorVoting was carried out under the auspices of the German president Horst Koehler and in cooperation with the German Central Office for Political Education (Bundeszentrale für politische Bildung). 70,000 adolescents participated in the project and the percentage of students voting was 90%. One year before that in 2004 German schools abroad had been integrated in JuniorVoting for the first time when voting alongside the European election. The project had been carried out in Poland and Austria. During this phase organisations and institutions in various member states are being encouraged to participate in the European Election 2009. Prerequisite is that those organizations and institutions are capable of realising the project individually in their own country. Organizations, which have carried out JuniorVoting in previous years as well as new institutions, which have not participated in the project before need to be integrated into the JuniorVoting project. During the second phase all participation organizations link up with one another on a European level. The aim is to form an alliance of institutions that would like to realise this European wide project together. At this point, finances are being discussed with the European Parliament or the European Commission as well as with the governmental institutions or foundations of the respective countries. The entire project will be started off with a European conference lasting several days at the beginning of 2008. All organisations that want to implement the Project 2009 parallel to the European election are meeting here. Focus will be an exchange of experiences about the various possibilities of how to realise the project and the development of a detailed plan of action. This builds the foundation for a successful cooperation in implementing JuniorVoting. Following the conference, each organization realises the project independently from all others in their own country. 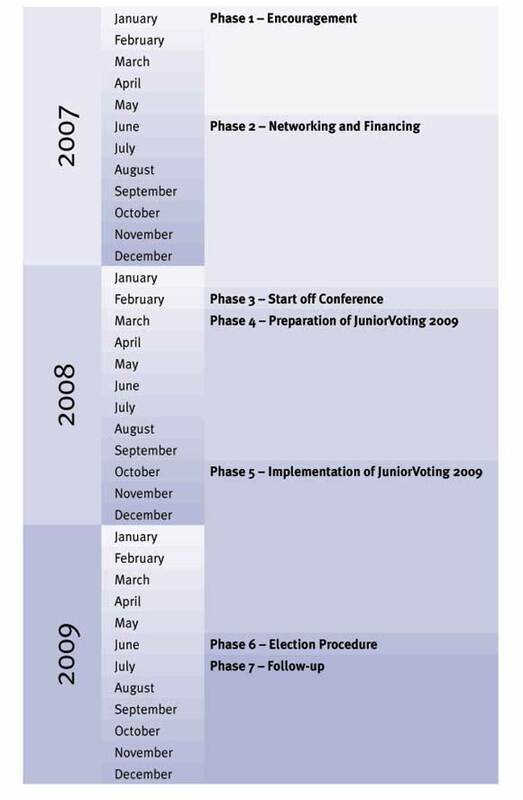 During this phase the various organizations in the member states prepare themselves for the implementation of JuniorVoting 2009. This involves forming networks that enable synergies between institutions in the respective countries. During the fifth phase schools are being encouraged to participate in the JuniorVoting 2009 project. This obviously depends on the financial situation. Once involved in the project the schools are being set up for the election, lectures are being prepared and support for the election is being offered. One week prior to the European Election 2009 JuniorVoting will be carried out at participating schools in all countries. Results are being announced simultaneously to those of the European Election. The project is being evaluated. Goals that were set prior to the project are being compared with the goals achieved. On the basis of this, joint plans of action are being developed.